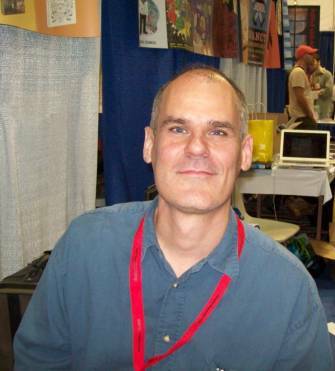 The educator and cartoonist James Sturm is another of my favorite people in comics. 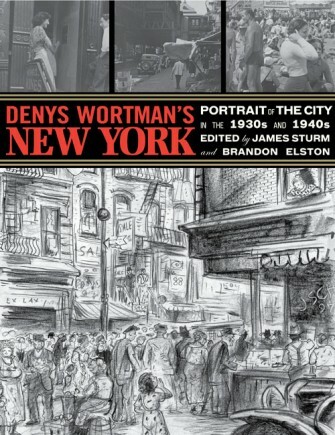 He's the co-founder of The Center For Cartoon Studies, the author of 2010's fine book Market Day and one of the driving forces behind the publication of Denys Wortman's New York. If there were a tree chart of 2010 comics events and underlying issues with lines drawn to the cartoonists engaged in some element of said issues, Sturm would appear on it looking like a marionette with tangled strings. TOM SPURGEON: James, I was wondering if I could start off by inquiring about the state of CCS. You're several years in, and the U.S. is in a period of general economic distress. Is the institution where you hoped it would be at this point? Have you exceeded your expectations in any specific ways? JAMES STURM: CCS welcomed its sixth class in the fall and I'm exceptionally pleased where CCS is at right now. I'm glad CCS got rolling before the economic downturn. We had a good head of steam before things went south and as result it didn't seem like it hurt us in the ways that it did for more established schools that have much larger infrastructure expenses. In terms of expectations, when I started down this road I didn't know for instance that Steve Bissette was living in Vermont and how great a teacher he would become. He really committed to this whole thing working in ways too numerous to mention. The fact that Jason Lutes would move to Vermont from Seattle and be such an exceptional teacher is also still astounding to me. I've been continually blown away by Alec Longstreth as well -- what an incredible addition he has been to the faculty. The quality of our faculty and students is really what makes this place hum. SPURGEON: Tell me more about Alec. Of the three people you just mentioned, he's the least known. Where did you find him, and what specifically does he bring to the table as a faculty member? STURM: Originally Alec did some summer workshops for us. We've been doing these summer workshops for kids 16 and over, starting the summer before we even started our regular curriculum. He did that, he was also a fellow for a year. We have a fellows program that a lot of people don't know about. Alec was a fellow, Chris Wright... Robyn Chapman was the first. The Belgian cartoonist Max de Radiguès. Alec brings a lot of energy and enthusiasm into the classroom. Plus he's so organized and smart that I wouldn't hesitate having him teach any class CCS offers. 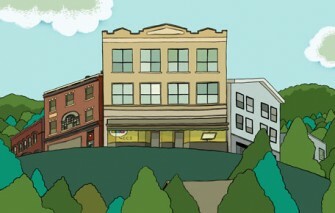 Cartooning is in his DNA and he's really serious about figuring out how to keep cartooning at the center of his life. His commitment is incredibly inspiring. SPURGEON: Have you been doing this long enough that you're seeing any differences between your newest class and your first? STURM: Each class is very different and I hesitate to draw conclusions as to why that is. I think CCS attracts somebody that really wants to be challenged, is more mature than the average student you'd find at a larger art and design college and is making a deliberate choice to hole up in White River Junction for a few years. SPURGEON: Is there a different orientation towards digital material even in that short time, perhaps? STURM: The students are certainly more out front in that regard than most of the faculty. We've had cartoonists like Kate Beaton and Meredith Gran come through as visiting artists. 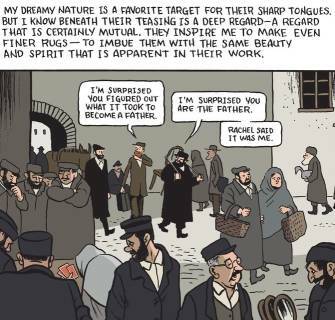 What makes their comics work is they are first and foremost good cartoonists. It seems important to me that the delivery system, while important to understand, should never be emphasized at the expense of working on hard work of trying to become a good cartoonist. SPURGEON: Do you think you're perceived differently now for having years under your belt? STURM: I'm not acutely aware of how we were perceived so unsure how to answer this one. We are not a start-up any more. We are financially stable and have gotten into a great groove in terms of curriculum. I hope more people are perceiving us -- it makes finding talented students and fundraising easier! One thing I think is changing is that I don't see CCS being described as James Sturm's school any longer. And that makes me kind of glad. It's a small school, but it's a decently-sized enterprise. At this point I'm not even the most integral member of the team in some ways. You could more than make a good argument for Michelle Ollie being the most critical person here. The faculty I've mentioned, the students, there are just a lot of voices and people involved. It's weird to even think of it as being my school. It's much bigger than that, and I'm so glad. I'm proud to be play a part in the whole thing, a vital part, but to call it my school is a disservice almost in a lot of ways. SPURGEON: In an ongoing conversation with Dave Sim he's presently putting on-line, Steve Bissette talked about the students with whom he's working adapting to the realities of the modern marketplace, and seems to be saying that it's on them to find a way to keep creating in the avenues that exist through which to create and potentially find reward. You've talked in the past about not wanting to burden artists that are learning to create and that are learning and applying skills with vocational issues; do you agree that this is what an artist confronts once they leave school, that these are unique challenges right now, or no? STURM: I agree with what Steve says here -- or at least your paraphrase. SPURGEON: We should probably make that super-clear. 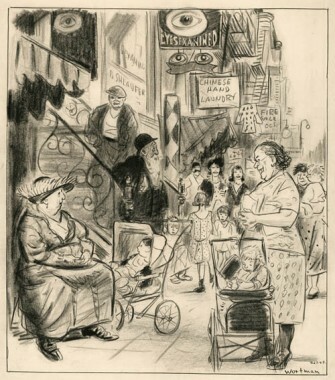 STURM: I think early on, when a cartoonist is still finding their sea legs it is important that they don't worry to much about vocational concerns, it takes focus, energy, and pleasure away from their work. I think any art school would be remiss if they didn't tackle these topics head on and CCS brings in publishers, agents, editors, and visiting artists that talk about a host of professional issues. CCS's curriculum is designed to help students transition from working in a structured environment to working independently. That said, most every student, whatever their vocation, is in for a serious transition when they leave school. 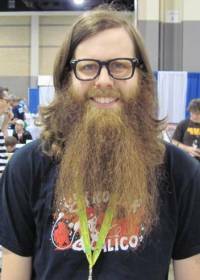 SPURGEON: I don't think I could characterize how much of starting CCS was as a corrective to what you experienced as a comics-curriculum educator up until that time, but do you think its existence has had a system-wide effect on how people approach the idea of pursuing schoolwork related to comics. Tom Hart and Leela Corman announced their intention to start a school in Florida, for instance. How do you feel about other institutions -- or other programs at bigger institutions -- with at least overlapping goals potentially springing up or simply moving to potentially react to what you've done? STURM: I think its too early to say what effect CCS may have. It seems to me that things here in WRJ worked out because of a unique fusion of talent, location and timing. I couldn't replicate this again if I tried. I'm a fan of Tom Hart and what he is trying to do. He's a special teacher and I hope the best for his attempt to get a school up-and-running. I love the model of having a small, intense, independent, workshop-oriented programs peppered throughout the country is a good one. These big art and design schools, while they have their advantages, can also lose focus on their students. SPURGEON: Are you happy with the way Market Day was received? It seems like the book hit a lot of people in a personal way, that they related to the situation and the emotional toll exacted on someone at the mercy of the market in an almost raw fashion. There's an underlying intelligence to the body of your work that I think of when I think of your books, and I wondered how you felt about the emotional impact of the stories you tell. Is that part of your intention? STURM: I was happy with how Market Day was received. I would think most creators want their stories to have an emotional impact. SPURGEON: When you're dealing with a story like Market Day that has an emotional component that hits a lot of people hard, where it gets really dark and personal there for a while -- when you're working on the book, are you aware of that emotional aspect as its own thing? Is that something you try to consciously enhance while creating the work or is that just something that comes out in the course of you trying to tell a specific story? 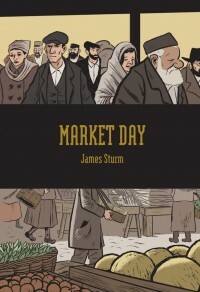 STURM: Market Day was certainly a more personal work than other things I've done in a way, and I wanted to be as true and honest to the impulses and feelings that inspired me to make the book. So I'm not deliberately trying to wring out excessive sentiment. Things can take a seriously maudlin turn if you're preoccupied with that. I thought I'd tell the story, and if some of that emotional resonance kind of seeped through the panels, I'm happy about that. If it didn't, it probably wouldn't stick to anybody's ribs. SPURGEON: The obvious question to ask of Market Day -- it's almost certainly something about which I asked you earlier this year -- concerns the vocational aspects of the work and the fact that it was published in the midst of this massive, worldwide recession. Market Day also arrived during a significant period of transition for most arts fields related to the ongoing growth in digital media equivalents and the increased use of the Internet as a distribution method. Was too much made of those confluences, do you think? Was that just an easy set of questions to ask? STURM: I think perhaps one of the reasons that the book maybe got as much play as it did was because of the timing of the economic downturn. I wasn't thinking those things when I did it. Every artist is in a perpetual recession. [laughter] There might be a few more opportunities when the economy is good, but let's face it, most people striving to do idiosyncratic or personal work, most of that stuff doesn't have a niche in the marketplace, and if it finds one, it can be very precarious. STURM: -- that's the nice way of saying "You're getting old." SPURGEON: Now that you're old, James, [Sturm laughs] do you have any insight as to why cons -- personal meet-ups, personal marketplaces -- have become so popular? STURM: I'm in the midst of reading Middlemarch right now, and the young artist goes off to Rome for inspiration and fellowship. I think it's true throughout the ages. In most of these places there are some older cartoonists, but there are a lot of younger cartoonists going to find that fellowship. I think these are places where you feel you're not alone, and you're not adrift and there is a community out there. I know some people hate that word, community, but I think it does help to feel like you're a little part of something, that you're not just totally wasting your life [laughter] filling in these little boxes. Which is easy to feel, it really is. SPURGEON: Do you feel common cause with other cartoonists? STURM: I definitely do. 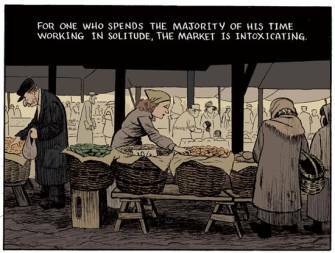 Even in Market Day, Mendleman's camaraderie with the other artisans, that was an important thing for me to write about. I definitely do. You're committing your life to this thing. I've created a little bubble here in White River where in some ways it feels like this is a normal thing to do. But by and large it's an odd choice. It's really easy to feel out of sorts. I think that what you can get from other people, that inspiration and fellowship, you can't underestimate that. Another way of saying it is that if you're jogging with three or four other people, you go a little further. You're not willing to stop at the first pang. The other people pick you up and keep you going. They challenge you. I think that's the same thing in some ways with cartooning. I remember in the early '90s when Eightball and ACME were coming out, it seemed like both of those guys were pushing one another further and further. I remember going on a tour with Seth in Europe in 2001 or 2002 and seeing these beautiful drawings he was doing in people's sketchbooks, and going home at night and thinking, "I gotta raise my game here. I have to figure out what I'm doing so I don't embarrass myself the rest of the tour." I think that's good. I see it here at the school. The students want to step up because they see what everyone else is putting into it. STURM: Jim Woodring is a little older, but Weathercraft is something to behold, too. SPURGEON: I agree. 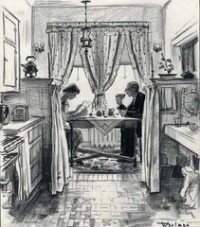 It seems like that whole group that we think of as those rising late '80s/early '90s cartoonists had quality work out. Do you think there's a reason that that group of cartoonists is still so prolific and active? Is it an accident of marketplace? STURM: Well, I don't think it's an accident. [laughs] I don't know. Some of those people you mention, I feel intimate with them, just through their work, because I've been reading it since their first public offering. Others are actually close friends. There's a certain level of prejudice. I'm not very objective dealing with their work. There are people that are younger than I am whose work I like -- Vanessa Davis -- whose work I'm kind of blown away by. But there is something... I don't know. There's something extra-special when you have that kind of intimate relationship with somebody and their work. It doesn't make their work any better, but in terms of reading, it feels a little bit like reading through a family album. 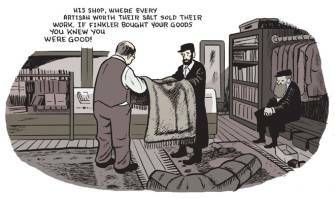 SPURGEON: One big story this year is that comics may have reached a tipping pint in terms of the inevitability of digital media. Everyone's in a different place digitally, from all in to still resisting, but the shift seems like it's ongoing and powerful. What interest do you have as an artist in seeing your work available through those channels? STURM: It depends on the kind of work. Something like Market Day, I cringed when I thought of a reviewer just reading a PDF of the book. So much of that book was texture, the way it was printed, the design of it. It was important that if that book was to be considered, it would be considered as a book. But there are other projects that could be as easily read on an iPad, I suppose. Like you said, it seems inevitable that this will be the primary reading device of comics eventually. I guess it depends on a project by project basis and what the intent of the artist is. SPURGEON: What about you as an artist? Do you foresee a point at which you start taking the iPad into account the same way you take into account the printing and the paper and the cover stock? 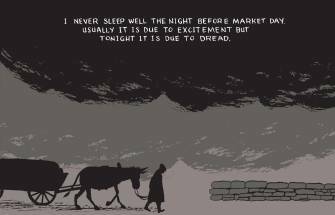 When does the James Sturm webcomic launch? STURM: I'm working on a project now that will lend itself to that kind of distribution. I have no problem with that. At all. When Kate Beaton was at the school, and showing her work, someone asked her what made her an on-line cartoonist and she said, "My work appears on-line." In terms of her approach, or the way she draws or the way she comes up with her ideas, she's no different that Jules Feiffer doing his strip. I'm sure there will be cartoonists who really think through that format in a way that feels novel and distinct, comics that couldn't work in print. I look forward to that when it happens. But nothing to me says I have to change the way I approach my work because of an iPad. In some ways, the way I work -- very discrete page units, my layouts are pretty straight-forward -- kind of lend themselves to that anyway. A few years ago we got a few kindles in the school library. We have an iPad at the school library and we brought the kindles in and we talked to the students about that. No one was that interested in formatting anything for the kindle. You don't want to hook your carriage up to that format horse; if everyone structured for the kindle, what would happen with the iPad. Maybe there will be a default format that will accommodate what people do. But this has been happening for a while. I remember when I was art directing at The Stranger, Charles Burns would send in his Big Baby comics. The way he had formatted it was in these half-page units that would work for the newpaper and then he would stack them for his pages. 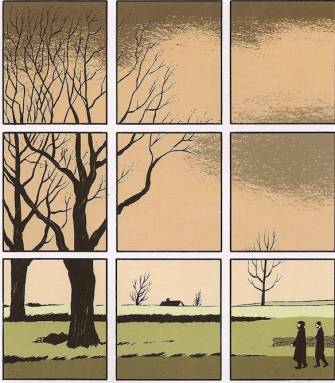 Chris Ware did that, too, with his newspaper work. He had an eye on the book later down the line. SPURGEON: It's very matter-of-fact; it doesn't seem like they were cooking something up, or working out of a theory, but making choices according to the options placed in front of them. STURM: It's a very labor-intensive process. If you can share work in process and find another outlet for it and build an audience and make a few extra dollars and rethink some formats and make some decisions based on that, that seems like a smart way to go to me. SPURGEON: I imagine I'm catching you three or four weeks removed from the launch of Denys Wortman's New York and all the publicity that goes with something like that. I really liked that book. And I have a sense of how long it took you to get it into print. Was that a gratifying experience to finally get that book out there where people could read it? STURM: It was really gratifying. I was thrilled, and I was thrilled for Denys Wortman's son. We had this big opening at the museum. Stan Mack was on the panel with Jules Feiffer and myself, a historian named Joshua Brown; it was such a celebration to see it there. It's a cliché to say that was a "labor of love," but it really was. I was taken with the work. I felt like there was an opportunity to share it with a bigger audience. I think this is one of the really most satisfying parts of being a director of an institution. You can put that in quotes if you want. [laughter] It allows me to knock on doors and instead of just being a cartoonist playing an angle I'm a director of an institute. I'm a little more trustworthy to other institutions or something. We'll be sending the announcement out in a couple of weeks, but Vermont is about to become the very first state to have a cartoonist laureate. That's a really exciting thing, to pull together different constituencies to make this happen. Down the road, I'm sure there will be a national cartoonist laureate as well. Setting this up, if I didn't have the legitimacy of CCS behind me, it would be much more difficult. SPURGEON: You lived with that book for some time; you were the only person seeing it. STURM: Brandon Elston as well. SPURGEON: You and the other people working on it. Was there anything about finally getting other eyes to rest on it that surprised you? One of the profiles, probably the one in the Times, featured someone talking about what it was like to see that work when it was originally serialized, and that kind of blew me away based on my own relationship to the work having just read it. What's it like to put it into other people's hands? STURM: We had a dedicated room called the Wortman room where the work was in stacks, categorized, and Brandon and I would meet and make selections and decided the shape of the book. Throughout the process I was bringing visiting artists into the room or when I was in San Diego or out and about I would bring pages to show publishers or people to stir up some interest. It never ceased to amaze me, this reaction when people saw the work. I showed it to you in San Diego. STURM: And it was like, "Wow." [Spurgeon laughs] He was drawing New York and he did capture the vitality of New York. But if the guy had lived in Rome or L.A. we would still have that wow because he had that kind of facility and commitment to drawing, this almost not quite finished but incredibly accomplished feel to it. It's amazing. It's also sobering as an artist to realize someone of that caliber can be almost totally forgotten. [laughter] So in that sense, it's a little poignant, too.